As we did a couple of days ago with the NCAA, we will take a look at some potential UFA forwards that the Canucks could target to help supplement their current prospect group. Although the forward ranks are not considered an area of weakness for the Canucks, there can easily be an argument made that there is a gap between the ‘youth movement’ with the big club and the next wave. Looking towards the CHL may be a worthwhile venture as their might still be some talent left. Yesterday we looked at two forwards from the QMJHL, OHL, and WHL each – but today we will profile three from the QMJHL, one from the OHL and two from the WHL. Just a reminder, the comparable percentages will be much lower for the CHL players. This is mostly due to the fact that most of the players of the same ilk will have already graduated to professional hockey, thus whoever is still in the CHL at this age usually has the odds stacked against them. Gritty two-way forward who earns his minutes. Not the fastest skater but is mobile at a productive level. Handles the puck well and makes conclusive decisions quickly. Not afraid to get physical and play in the hard areas of the ice. All-in-all, a versatile grinding forward with some offensive potential. Forsberg has seen an increase in offence year over year and has 84 points, which includes a whopping 56 assists, in 68 games this season. What is particularly impressive about Forsberg this season is that is running at 1.015 primary points/GP. Which is good enough for 11th in the WHL, and first amongst UFA forwards in the WHL. When looking at his comparables, 4.84% went onto becoming NHL regulars. Jon Martin was signed by the San Jose Sharks last week, and although Forsberg is almost 7 months older, he beats him in every offensive category. Martin’s comparables went onto becoming NHL regulars 7.0% of the time. Given the scouting report of being a versatile and hard working player, it won’t be surprising to see Forsberg get a contract from an NHL team. 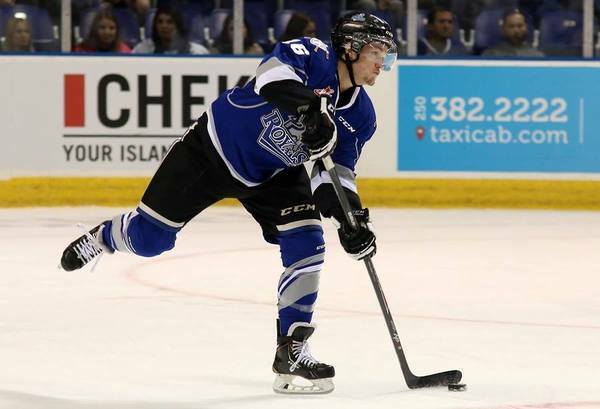 Teammate of current Canucks prospect Tate Olson, Chase Witala is another option out there. After being based over in the 2015 NHL draft, Witala was invited to Dallas Stars training camp and traverse city prospect tournament. He didn’t do enough to earn a contract, but obviously Dallas wanted to take a longer look at him. Witala has increased his point production to 1.11 PPG this season while playing the entire season in the top 6 for the Cougars. Through my viewings of Tate Olson, Witala is someone who has never really caught my eye as a standout player – but he isn’t short of skill and has shown flashes of smart offensive players. Witala rates extremely close to Forsberg, as 4.9% went onto becoming NHL regulars. So obviously with both of these WHL forwards, 19 out of 20 of these types of players will ‘bust out’. For players like this, given that the Canucks do own their AHL affiliate, it would likely be the prudent thing to do to offer prospect tournament invites and then if things go well, an AHL contract. However given Dallas’ previous interest, someone like Witala may get a NHL contract offer. The Peterborough Petes forward is the only OHL forward, based on point production, that stood out as a possible UFA option. Garlent has seen an explosion of offensive production this season with 82 points in 65 games so far this season. Garlent’s previous OHL career high in points was 40, he has 38 goals alone this season. Garlent appears to be a classic case of a player who has filled out and is now much larger and stronger than most of his competition. When looking at comparables, 2.6% went onto NHL careers. In my opinion, that number isn’t really worth the dice roll. The aforementioned WHL players give you a 2:1 odd of an NHL regular. Part of the reason why there is only really one OHL option here (and not a very good one) – is because the OHL seems to have their talent drafted or signed much earlier when compared to their counterparts. If they are good enough to attract interest, they will get snapped up before they reach their UFA status. Michael Joly was traded to the Cape Breton Screaming Eagles this season in a blockbuster deal. This is after he put up 21 points in 20 playoff games with Rimouski last season. Since joining the Eagles, he has 31 goals in 37 games playing with highly regarded players like 2016 draft eligible Pierre-Luc Dubois, Arizona prospect Maxim Lazarov and Detroit Red Wings first round pick Evgeny Svechnikov. 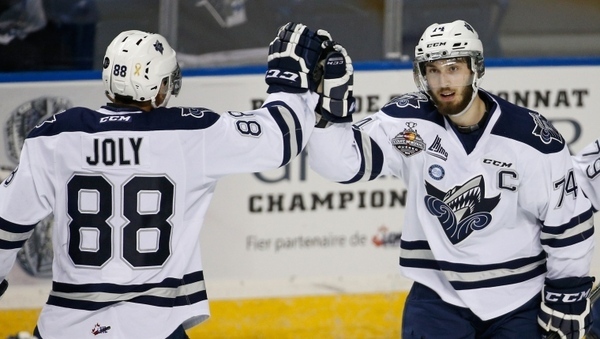 Joly is currently 12th in the QMJHL in PPG with 1.448. He has previously attended Buffalo Sabres training camp in 2014 and Toronto Maple Leafs camp in 2015. When looking at comparables, Joly’s matches went onto becoming NHL regulars 5.26% of the time. Measuring in at 5’11” and 172 lbs, Joly has some weight to gain. But given his offensive numbers in last years playoffs and the boost in production this season, he may be a worthwhile gamble for a team. You can add weight and strength to a player, but adding good offensive instincts isn’t something that can usually be taught. Another former Quebec Rampart that was traded after their run to the Memorial Cup, Guillaume Gauthier is another intriguing option on the CHL UFA market. Shooting left and measuring 5’10” and 185 lbs, Gauthier has played extremely well for the Sherbrooke Phoenix this season putting up 38 goals and 45 assists in 64 games so far this season. A smaller guy with a good shot and above average play making skills. When looking at comparables – Gauthier comes in at 5.6% going onto becoming NHL regulars. Originally drafted by San Jose in the 2nd round of the 2013 NHL entry draft, Paquin-Boudreau re-entered the 2015 NHL entry draft after San Jose chose not to sign him. He went undrafted this past June. All of this is likely due to him only playing 7 games last season due to injury. Paquin-Bourdreau was traded from Chicoutimi (where Canucks prospect Zhukenov plays) to Gatineau in early January where he has continued his over a PPG pace this season. Using my own ‘eye test’, I have liked his awareness and hockey IQ when pressured. When he is left alone, he has the ability to use his teammates to generate offence quite well. Interesting to see that the Sharks passed on players like Madison Bowey, Eric Comrie and Tyler Bertuzzi to draft the young Quebec native, to then choose to not sign him. As we’ve been doing this whole time – when looking at his comparables, only 5.7% went onto becoming NHL regulars. However given that last season was a write off for him, I think Paquin-Boudreau would be a worthwhile gamble. He showed enough in his draft year to warrant a second pick, and has rebounded quite nicely this season. As clearly evidenced by the comparable rates of the CHL players, teams are better suited to target the NCAA market for forwards. But that doesn’t mean there isn’t some viable options available for depth players across Canada. Paquin-Boudreau is of particular interest to me. I would suspect a few of these free agents will get some contracts, or at the very least some invites to training camps. Tomorrow, we will take a look at some of the goaltenders that are available in the NCAA and CHL. Well San Jose “stole” Jon Martin from us after we showcased him at the Penticton Young Stars tourney, so maybe we return the favour by signing GPB. No real standouts here then, everyone hovering around 5%. Looks like we’d be better off pushing for one of the two 10% defensemen you listed in the other article. Three if Liberati doesn’t have any hard feeling about being a ‘catch and release’ Canucks draftee. I live in Victoria, so I get to see Alex Forsberg quite a bit. Definitely looks like there could be something there. He seems to be in on almost every goal the Royals score. I’m also curious to see what will become of Tyler Soy. He flirted with a ppg pace last season, and this season he has almost as many points as Forsberg, but he’s younger. He was passed over in his first year of eligibility but he met have shown enough to get snatched in a late round at this year’s draft. If he reaches free agency the Canucks should definitely make an offer.